Today both boys were able to attend their German school. YAY!! I wasn’t sure about Nathaniel but in the end, I thought it was time. Sadly Tony and I are not doing that well. I am okay as long as I am on Advil but when I am not on it, I feel AWFUL. Tony did well till about this afternoon then he wasn’t doing as well. 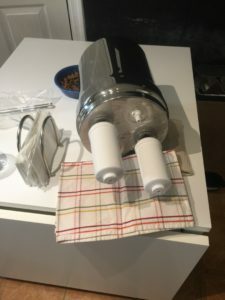 We got our new water filter. The township we live in gets their water from an neighboring town. Sadly this means that we have very little say over what happens with our water. It is owned by that township. 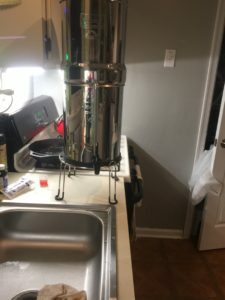 So in the last few years people have been indited, from September to November there was a water filter that wasn’t working, and they didn’t notice, we have had numerous “This was elevated and is bad in your water” notices and one time they didn’t tell us for at least 3 days that we needed to boil our water. Our mayor is doing her best but honestly this needs to come from the state at this point but that isn’t likely to happen. So in lieu of moving, we decided to get a water filter. 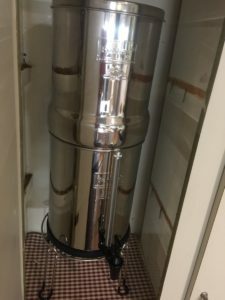 We selected the Berkey and in the “Royal” size or about 3 gallon capacity. We also got the fluoride filters as we don’t want anything else bad in our water. We have no problem with fluoride but if it is filter that, then it should be filtering out more or less everything. Inside of the unit. This is showing the fluoride filters, there are also black filters inside the shiny bit. We are storing it in a pantry with a door on it. This will prevent little hands from playing with it when we get our next placement. We also have the clear view spigot so we can see how much water is in the lower chamber. Handy thing to have. We have tried the water and it tastes like nothing. Seriously, I grew up in Washington and as long as you stay away from Hanford, the water there is normally fairly good. My mom even had a well at her last house and that was some of the best water I have ever tasted. However, this water tastes exactly like nothing. No after taste, no anything. It is really odd.